What is Salesforce for Wealth Management? Essentially it’s an app (overlay) – a collection of custom objects, code and analytics that is installed in your Salesforce instance. It’s designed for a single audience – Financial Advisors (Wealth Advisors). 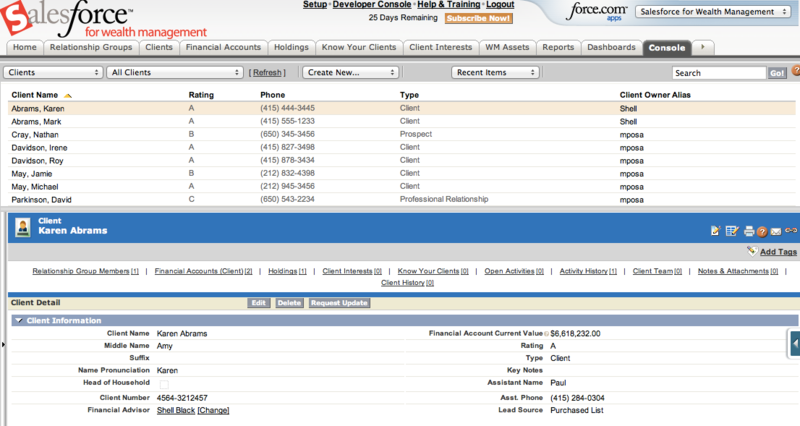 It’s a highly tailored view and organization of client information, investments and professional relationships. This blog post takes a look "under the hood" of this popular installation of Salesforce (what Admins need to know!). If you are new to Salesforce, the easiest way to get it is to start a fresh org with the app preinstalled. That can be accomplished by contacting the financial services sales group at Salesforce or starting a free trial direct from the Wealth Management page on the Salesforce website (look for the "Register Now" link on the bottom right of that page). If you are an existing customer with Salesforce already up and running, you can still get the app by going to the AppExchange. If you go that route, be sure to look at the customization guide from Salesforce Labs and make sure you’re comfortable with the installation and setup steps (there is quite a lot to do as an Admin!). There are a couple things you need to be aware of from an Admin setup perspective. You’re going to be using Person Accounts, enabling Account Teams and renaming Accounts to "Clients." Yep, I said Person Accounts. For those not familiar with Person Accounts, it’s a virtualization of Accounts and Contacts (i.e. squishing data elements from both objects together) at the Account level using Record Types. It’s designed for B2C (Business to Consumer) rather than B2B selling. You’ll have information (fields) that normally resides at the Contact level (mobile phone and email address for example) residing at the Account level. In this application, the Account level is the "Client" level. The alternative method would have been to use the traditional Account / Contact data model and have the Account become a "Household" (e.g. "Marc and Lynne Benioff Household" with standard Contacts residing below (e.g. Marc Benioff as a Contact record and Lynne Benioff as a Contact record). We’ve done quite a bit of work with Financial Advisors / Wealth Managers and we’ve seen it done both ways. 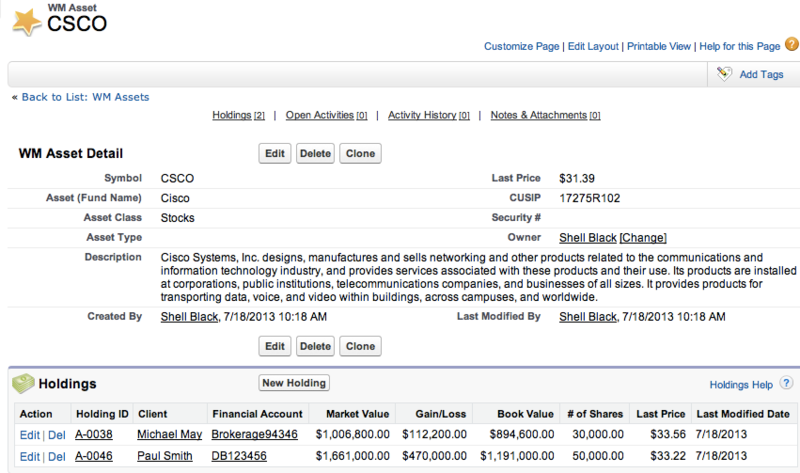 The Wealth Management overlay uses a custom object to join together the clients in a relationship (more on that later). There are a slew of custom objects that are installed with the App. Let’s go through and give you the highlights of each one and the intent of how they are to be used. When you see Financial Accounts, think 401k, 403b, CD, Brokerage Accounts, Mutual Funds, 529s, etc. These records have information like date the account opened or closed, the name of the account, account numbers, values, tax status, etc. Holdings are the individual positions (fund, bond, individual stocks) a client has in their Financial Accounts. They are a child record of Financial Accounts. It will list how many shares were bought and at what price. Holding are also related (via a lookup) to a "Symbol" (i.e. the stock ticker) – see the "WM Asset" below. Client Interests is a simple custom object. It’s a place to record what investments the client would like to get in or out of (i.e. expressed interest in buying or selling). Know Your Clients (sometimes referred to as KYCs in some documentation) are a place to snapshot your in-depth conversations and meetings with your Clients. It’s what you know about your client at a particular point in time. I like this custom object a lot. It allows you to list variables that change over time like employer, risk tolerance, current salary and other sources of income, marital status, tax bracket etc. Over a multi-year relationship this can provide a nice historical perspective of a client from the working years through retirement. I can see these records being filled out in annual or biannual meetings with Clients. There is also an approval process on this custom object. 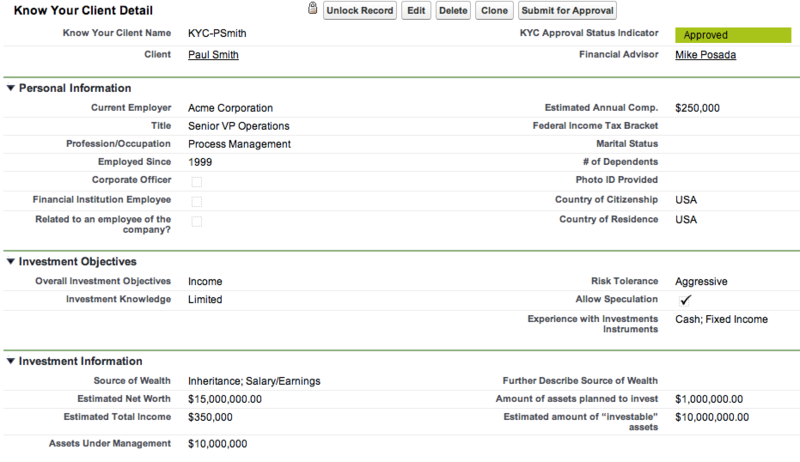 It’s designed for larger firms where a senior advisor needs to review these records (maybe for compliance?). It makes sense, but I’m not sure how often it will be used, if at all in a small firm. Relationships are a join object in the database to allow you to relate a Client to one or many Relationship Groups. You can use this to join Spouses together in a group (household), show that a professional relationship (i.e. a CPA, attorney, etc) has a relationship with multiple groups (households), or use it to relate beneficiaries to a Trust. You can have a max of 20 Clients in a Relationship Group. There is quite a bit of custom code wrapped around this custom object to make it easier on users (it’s actually a mini app inside the Wealth Management package). When you start a new Relationship you’re presented with a wizard to allow you to relate a Client to an existing Group or create a new Group on the fly (pretty cool!). 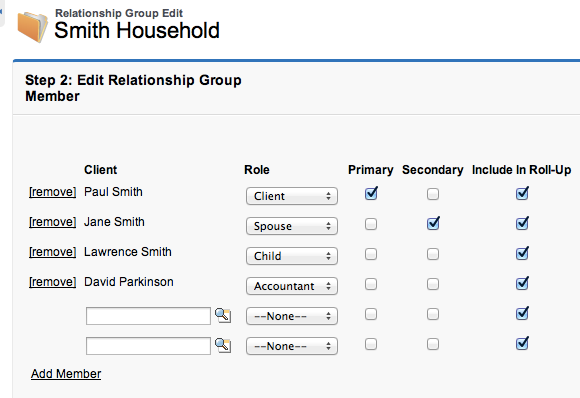 You have a nice edit screen where you can see all the Clients in that relationship and designate the role of that Client in that particular Relationship Group (i.e. Client, Spouse, Child, etc – it’s customizable) The Primary and Secondary checkboxes allow you to denote who is the main Client contact (the main / "Primary" investor) and the Secondary checkbox is typically used for the spouse / significant other. The "Include in Roll-up" checkbox allows activities, Financial Accounts and Holdings from that particular Client record to display at the Relationship Group level (as a related list). Therefore you probably will not want to check this box for the professional relationships (Accountant, Attorney). If you use the Primary or Secondary Checkbox, there is a graphical icon showing these key players versus other roles in the group. Like a said before, there is quite a bit of custom code being leveraged here. One example is that if you associate Clients to a Relationship Group and have the "Include In Roll Up" checkbox checked, you’ll see their Financial Accounts and Holdings and displayed at the Relationship Group level in related lists. Now you can see all the assets for a household in one place without having to drill down to each Client – pretty slick! The concept of the Client Team is to show which Salesforce Users manage that particular client relationship. This has more value in larger firms with multiple Financial Advisors and support staff. Conceptually it is the same as "Account Teams" in Salesforce. WM Assets tab is great in that you can look at particular "Symbol" or stock ticker and see all the Clients that have Holding in that Asset. If you remember when we discussed the Holdings object, each holding is related to a "Symbol" (i.e. an Asset). That lookup relationship at the Holding level gives us this roll-up view at the Asset level. Very handy if something dramatic happens with a fund or stock and you want to see which of your clients are going to be impacted! Nerd Alert! 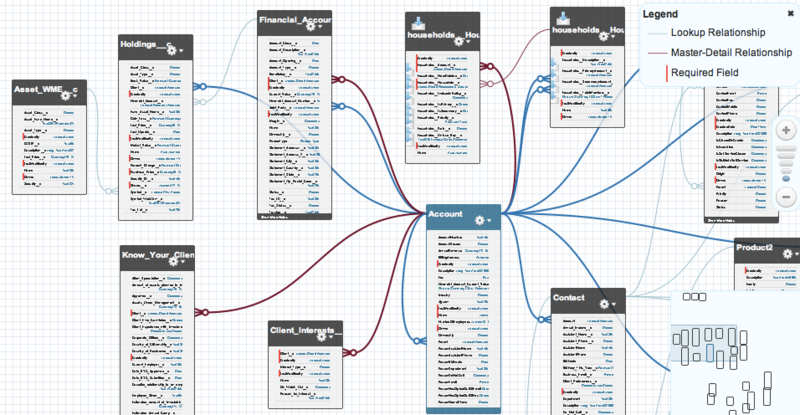 For those data model junkies, here is a view of the aforementioned objects using the Schema Builder to give us a visualization. Also activated in the Wealth Management app is the Console. The Console is a multi-pane view in Salesforce that makes it easier for users to setup call lists. This is great for Wealth Advisors (or their Admins) when calling to setup appointments with Clients. The Console is standard Salesforce functionality so no need to elaborate further. 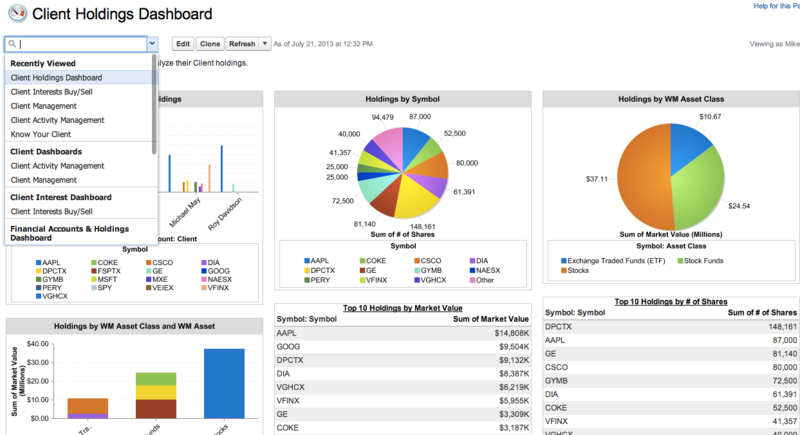 The Wealth Management overlay comes with a set of pre-canned reports and dashboards. All standard Salesforce functionality. You can create as many reports and dashboards as you’d like. Other core Salesforce functionality still exists, it’s just hidden "out of the box" with the overlay. Campaigns, Cases and Leads are still available and included if you’d like to use them. I would think most Wealth Advisors are not going to use Leads but denote a Client as a "prospect" at the Client level. 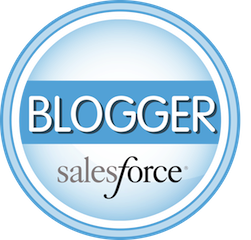 Additionally, here is a technical review of Salesforce Insurance Edition.